PHOTO BY MARYANN KROMER Calvert sophomore Brooke Coan speaks to Capt. Guy Gruters at the close of his program. Nearly 35 years ago, U.S. Air Force Captain Guy D. Gruters was reunited with his family after more than five years as a prisoner of war in Vietnam. 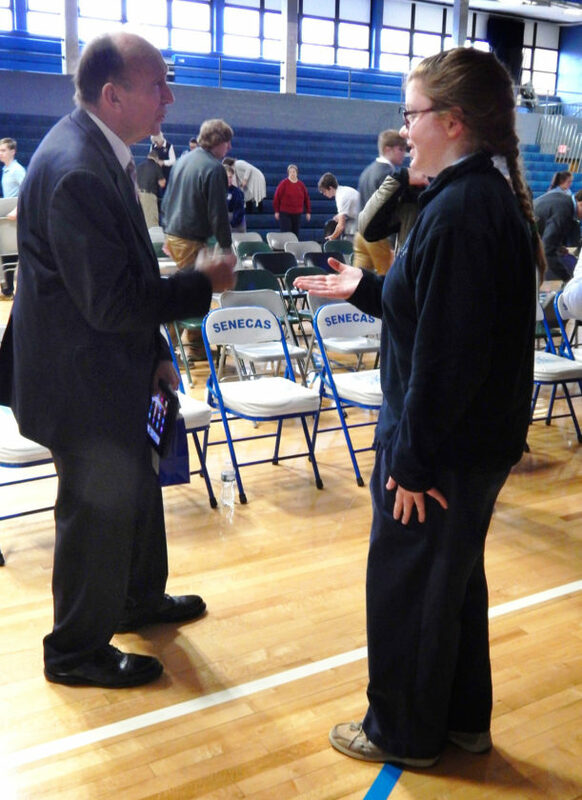 Now an author and motivational speaker, he addressed the Calvert student body Friday in the school gymnasium. Before his presentation, Gruters said he was born in Florida, and grew up in New Jersey, not far from New York City. His father was a World War II veteran who served in North Africa. After high school, Gruters enlisted in the Air Force and went to Vietnam. He has a collection of medals from his military service. Since retiring as an airline pilot, Gruters and his wife have lived in rural Ohio for 23 years, currently in Sidney. Gruters spoke about his book, “Locked Up With God,” which was released in 2012. It describes how he survived imprisonment and torture through his Catholic faith. Vietnam veteran and former Calvert teacher Paul Jones read the book, attended one of Gruters’ talks, and arranged for him to speak at Calvert. Jones and several other attended Friday’s program. In a video prepared the school’s media class, Gruters defined “patriot” as one who is willing defend the freedom of his country and its people from tyranny. At the Air Force Academy, Gruters was active in boxing and judo. He earned a master’s degree from Purdue University. He said he gained more self-confidence flying more than 400 combat missions over Vietnam in a year. Then he was shot down. “It’s very humbling to get shot down,” he recalled. The first time, Gruters was rescued by American forces. However, the second time, he was captured, confined in a prison camp and later moved to the “Hanoi Hilton” prison complex. The seclusion, unsanitary living conditions and torture were even more humbling, he said. Prisoners endured lengthy brutal beatings on top of wounds and fractured limbs and/or being bound in painful positions for days at a time. He also observed the effect of power on some guards. Men who came to the prison as ordinary soldiers could become cruel monsters within three months, he said. After four or five months, Gruters said anger and hatred consumed him and kept him from sleeping. Gruters said he considered suicide, because it would stop the pain and break the enemy’s power over him. However, he remembered a teacher in Catholic school saying suicide is a cowardly act. It leaves its mark on loved ones and is a serious offense against God, he said. Realizing the “voices” were not God, he concluded he must forgive his tormentors. It was difficult. He said he prayed, often on his knees, that God would help him survive and forgive. Once the forgiveness happened, he found peace. Gruters believes his suffering taught him patience and strengthened his faith. He said the prison served as a monastery in that regard. “God humbled me. … He’s totally in charge,” he said. After the POWs were brought together in Hanoi, they were able to communicate by code and exert passive resistance to conditions in the prison. They conducted religious services and refused to give them up, even after torture. Prayer and leadership among the prisoners helped them endure. When he returned to the United States in 1973, Gruters was diagnosed with 11 parasites in his liver, lungs and brain. Eight of them are common in Southeast Asia. Gruters believes daily exposure to human waste was largely responsible. Gruters advised students to pray every day and let God work through them. He said to smile more, live with honor and be grateful to have loving people around them. “Thank God every morning,” he shouted. Guy’s younger brother, Peter, has written “Heroic Love,” a book which is being made into a movie. It focuses on the efforts of Gruters’ family to advocate for his release. It also pays tribute to those who fight for American values. “These ‘heroic loves’ are very important for the country to see now,” Guy Gruters said. He expects the book to be released later this year and hopes it will give Americans insight into the effects of war on families, troops and the country. Some Calvert students and their teacher have been doing research and composing letters on behalf of Gruters, hoping to nominate him for a Congressional Medal of Honor.